TSA orders airport valets to search parked cars: My prediction: the TSA will erect a sign at the valet drop-off saying, “By valet parking, you agree that we can search your car.” And that will be the end of it. From the West Yorkshire, UK police Twitter feed (@WYPDogs). The Guardian has published a video in which NSA whistleblower Edward Snowden speaks with Guardian editor-in-chief Alan Rusbridger and reporter Ewen MacAskill in Moscow. MIT engineers have developed a pair of robotic fingers that are worn around your wrist to enhance your own grasp. 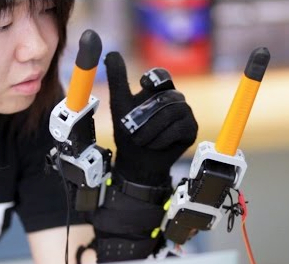 The fingers are controlled by your own fingers via a new control algorithm. Is Il Giardino in Cap-Ferret the worst restaurant in France? This song always makes me think of you. Dunno why. Maps of corporate tax-avoidance hairballs: OpenCorporates has a data-visualization tool for peering into the corporate tax-evasion structures of big corporations — subsidiaries nested like Russian dolls made from Klein bottles. He was allegedly drunk, and had at least two victims before SFO’s crackerjack private aviation security outfit, Covenant, noticed (they’re the same ones who smashed my brand new camera some years ago and refused to take responsibility for it). DHS to employees: reading newspaper coverage of Snowden’s NSA leaks is “classified data spillage”: The US Department of Homeland Security is warning its employees that they can be punished for opening up this Washington Post article, which includes a classified slide (above) illustrating how the National Security Agency spies on communications. It’s not just Ikeahackers: Ikea has gone all-out war on its web-fans. I saw the movie Dawn of the Planet of the Apes over the weekend and was amazed by its greatness. I applauded at the end with the rest of the audience. Last night I tore through Hiroshi Sakurazaka’s All You Need Is Kill. I have not bothered to see Edge of Tomorrow, a movie based on this fine piece of battle armor/combat genre sci-fi, but now definitely I will. The FCC’s site has been so hammered by comments from people angry about its plans to enact Cable Company Fuckery that many haven’t been able to get through. Weird Al Yankovic, still at it with “Foil,” a parody of Lorde’s “Royals,” from his new album Mandatory Fun.